Samsung said it had started mass production of its eUFS 2.1 storage solution featuring a 1 TB capacity for smartphones. Apart from its massive capacity, the drive offers a sequential read performance that is two times faster when compared to a typical SATA SSD. Samsung expects the device to be used by high-end smartphones “soon”. 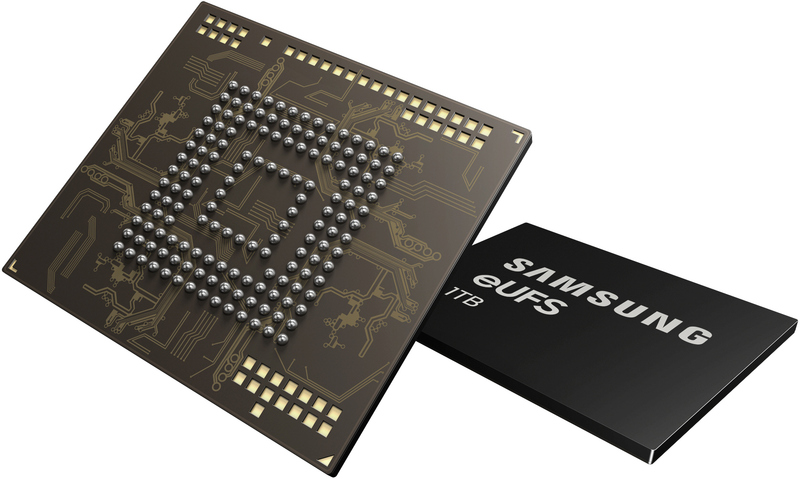 Samsung’s eUFS 2.1 storage solution comes in an industry-standard 11.5 mm × 13 mm package and is based on 16 512 Gb V-NAND flash memory dies as well as a proprietary controller. The drive is compatible with SoCs featuring a UFS 2.1 interface that are relatively widespread these days. When it comes to performance characteristics, Samsung claims that the drive is rated for up to 1000 MB/s sequential read speed as well as up to 260 MB/s sequential write speed. Random read/write performance of the drive is up to 58K/50K of read/write IOPS. The new drive is tangibly faster when compared to Samsung’s previous-generation 512 GB eUFS 2.1 solution, so the upcoming smartphones will offer not only more storage, but also higher performance. Obviously, any eUFS 2.1 device is orders of magnitude faster than any microSD card. What is a bit surprising is that Samsung decided to stick to the UFS 2.1 spec instead of adopting the faster UFS 3.0 specification that is supported by Samsung’s own Exynos 9820 mobile SoC (and it is likely that other upcoming leading-edge SoCs either do already, or will support it shortly). Samsung did not disclose pricing of its 1 TB eUFS 2.1 drive, but since this is the industry’s highest-capacity eUFS storage device, it will naturally carry a premium price tag and so will smartphones featuring the chip. In addition to announcing its new eUFS 2.1 storage solution for high-end smartphones, Samsung also said that it would expand production of its 5th Gen 512 Gb V-NAND memory later in the first half of 2019, which will enable it to boost production of eUFS drives in general and 1 TB devices in particular.